Huge Savings Item! Free Shipping Included! Save 20% on the Patio Armor SF40274 80-Inch Premium Mega X-Large Grill Cover, Black by Patio Armor at Go Plots. MPN: SF40274. Hurry! Limited time offer. Offer valid only while supplies last. If you've invested in a big grill as a center piece for your patio and can't seem to find the perfect cover, finally there is a solution. If you've invested in a big grill as a center piece for your patio and can't seem to find the perfect cover, finally there is a solution. Designed to protect the sensitive materials and finishes on today's high end grills, this cover will protect your investment throughout the seasons. Made from high grade polyester, our classic Patio Armor Premium grill covers resist cracking, fading, tearing, and mold build up. The underside is coated with a water resistant material for further protection from the elements. 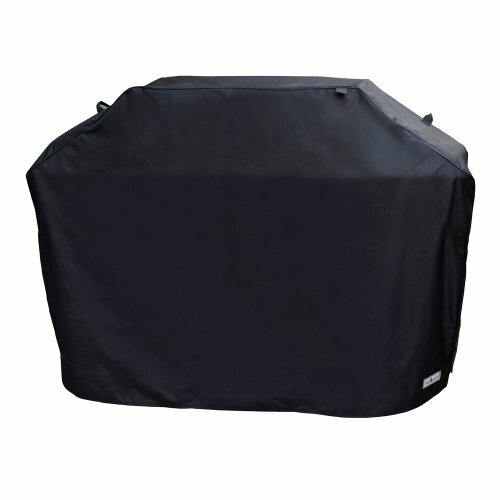 For added decorative style, the grill cover includes double seam stitching and black trim piping. You can be confident that your grill is secure through the seasons. You've invested a lot in your grill and you should protect it with the best. If you have any questions about this product by Patio Armor, contact us by completing and submitting the form below. If you are looking for a specif part number, please include it with your message.